Deciduous tree high up to 35 m. With long scales on acorn cups. Flowering May-June [Delipavlov & al, 2003]. The species is distributed throughout the country, between 0 and 1200 m altitude. [Delipavlov & al., 2003]. de Rigo, D., Enescu, C. M., Houston Durrant, T., Caudullo, G., 2016. 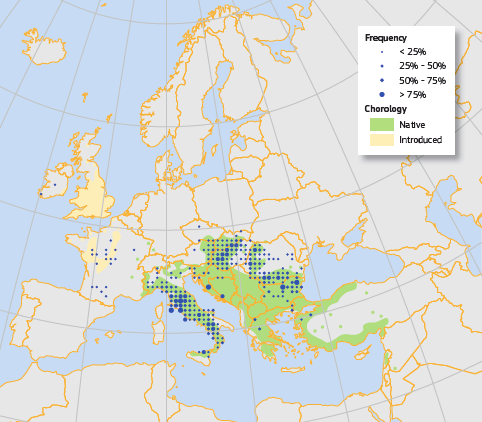 Quercus cerris in Europe: distribution, habitat, usage and threats. In: San-Miguel-Ayanz, J., de Rigo, D., Caudullo, G., Houston Durrant, T., Mauri, A. (Eds. ), European Atlas of Forest Tree Species . Publ. Off. EU, Luxembourg, pp. e01b479+.